There are some purchases that should absolutely be no-brainers because they pay for themselves. Once example is a cable modem, which you can get for $50 and then save $120 a year in modem rental fees. 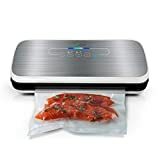 But another example people don’t think of quite as often is a good vacuum sealer like the NutriChef Automatic Vacuum Sealing System. By keeping your food fresh longer, you end up throwing away fewer leftovers. That means you need to buy less food, so you save money. You also produce less waste, so it’s good for the environment. It really is a win/win.